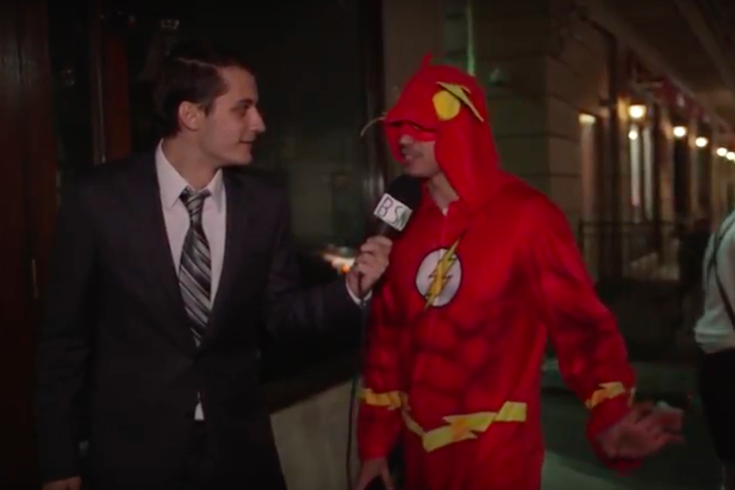 Scott Bigos interviews the Flash on Halloween weekend in Philly. Last year, local filmmaker Scott Bigos and his friend Brian Clarke took to the streets of Manayunk to interview the drunken 20-somethings in costume roaming in and out of the bars for Halloween weekend. This year, Bigos and Clarke took their "newscast" to Center City Philadelphia, and the results were once again predictably hilarious. There are those who get a bit philosophical, such as the man dressed as Jesus who contemplates his father's support during his formative years. There are those who stay committed to their character, such as "Macho Man" Randy Savage. And there are those who say things they will probably later regret, à la the "doctor" who makes a pretty gross comment. Their 2016 video got more than 46,000 views on Facebook. You can watch the 2017 version below, but be warned, it contains plenty of explicit, NSFW language.